S-Corporations are kind of like a less formal version of C-corporations. S-Corporations provide investment opportunities and that coveted limited liability protection. But, unlike a C-Corporation, S-Corporations only have to file taxes annually and they are not subject to double taxation. Is an S-Corporation the right entity type for you? This is a great question to explore when starting a business, or changing the structure of your existing business, because of the difference in taxes, the number of shareholders and asset protection. The S-Corporation is perhaps one of the most popular business entities that we form. 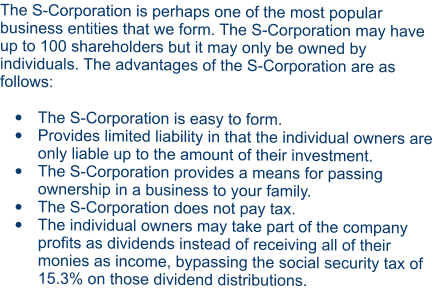 The S-Corporation may have up to 100 shareholders but it may only be owned by individuals. The advantages of the S-Corporation are as follows: • The S-Corporation is easy to form. • Provides limited liability in that the individual owners are only liable up to the amount of their investment. 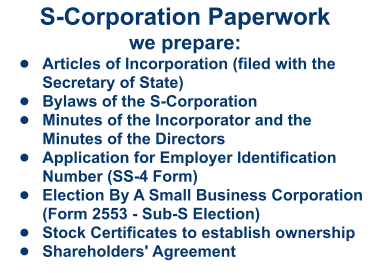 • The S-Corporation provides a means for passing ownership in a business to your family. • The S-Corporation does not pay tax. • The individual owners may take part of the company profits as dividends instead of receiving all of their monies as income, bypassing the social security tax of 15.3% on those dividend distributions. We can advise you in the formation and review of corporations, and can help you make sure you are getting all the possible benefits from your corporation. Proper formation and management of an S-Corporation can ensure you maintain the proper tax benefits and limited liability. Contact Ingersoll Firm if you need help establishing or maintaining an S-Corporation. We have the expertise to keep you in compliance while maximizing your benefits. S-Corporations are kind of like a less formal version of C-corporations. S-Corporations provide investment opportunities and that coveted limited liability protection. But, unlike a C-Corporation, S-Corporations only have to file taxes annually and they are not subject to double taxation. Is an S- Corporation the right entity type for you? This is a great question to explore when starting a business, or changing the structure of your existing business, because of the difference in taxes, the number of shareholders and asset protection. Proper formation and management of an S- Corporation can ensure you maintain the proper tax benefits and limited liability. Contact Ingersoll Firm if you need help establishing or maintaining an S-Corporation. We have the expertise to keep you in compliance while maximizing your benefits.